Finally, .DEV domains will be available for general registration on February 28, 2019 (16:00 UTC). All .DEV pre-orders are submitted automatically on the launch date as soon as the registry opens. Google is positioning the .DEV top-level domain toward developers and the tech industry, presumably in an effort to repair some of the damage caused by originally aquiring the .DEV tld a few years ago. As with, .APP which launched in 2018, HTTPS security is on by default. The entire TLD has been added to the HSTS preload list, so most modern browsers will force the domain to have an SSL cert before it will load. It is not necessary to have an SSL cert at the time of registration and it would likely be possible for someone to use the domain for non-http uses without an ssl cert. Because others may be seeking the same domain name, we cannot guarantee your pre-order registration. All domains ordered by multiple customers will go through an internal lottery once the pre-registration period is over. If your order is selected by iwantmyname, it will then be submitted against all other domain registrars who may be after the same domain. For some of the more popular requests, it will take a bit of luck, but rest assured, we will do our very best to secure your requested domain for you. .Dev domain Pre-orders are still open, so if you have dreams of getting that perfect .dev domain, now’s the time. Good luck! And of course, if you have any questions, just send us a message. We’re always here to help. One of the biggest challenges to productivity in the digital age is focus. Our devices and apps are all vying for our attention, and our brains have become trained like Pavlov’s dogs to react to notification sounds and digital distractions. Ping, a new email has come in, better stop writing this blog post to check what exciting thing has arrived in my inbox. Sure it’s just a reminder that there are only 12 hours left of a sale at a store I’ve never heard of, but (shrug) I had to check. Below are some screenshots of my own notifications this morning. We’ve already talked about some of our favourite productivity apps but now let’s look at some that are specifically designed to help you maintain focus when you're working. In a series of experiments that looked at the effects of noise on creative thinking, researchers at the University of Illinois at Urbana-Champaign had participants brainstorm ideas for new products while they were exposed to varying levels of background noise. Their results, published in The Journal of Consumer Research, found that a level of ambient noise typical of a bustling coffee shop or a television playing in a living room, about 70 decibels, enhanced performance compared with the relative quiet of 50 decibels. A higher level of noise, however, about 85 decibels, roughly the noise level generated by a blender or a garbage disposal, was too distracting, the researchers found. Coffitivity is free to use in a web browser or you can download for iPhone 9/yr of premium. Working in a noisy cafe, or with the Coffitivity app works really well to help some people focus and get work done. Personally, I find it stressful and distracting. My mind finds white noise and nature sounds much easier to focus with. My favourites are from SimplyNoise. I use their SimplyRain, with lots of thunder, to help me focus when I’m working, especially when I have a lot of writing to do. If rain’s not your thing, SimplyNoise has options for crackling fire, waves crashing on a beach along with basic white, pink and brown noise. SimplyRain has rain background noise - you can adjust to add thunder, adjust the intensity of rain, set timer (great for sleeping). Free version works in any web browser with Adobe Flash enabled. SimplyRain can be added to the SimplyNoise app for iPhone or Android for 0.99. White noise is used to help with sleep, meditation, calming the senses and to help with focus. If you’re already using a white noise or background sound to help you sleep or meditate, I’d suggest finding a different type of sound to help focus when it comes time to getting work done. When it comes to writing blog posts, articles, web site content, or reports sometimes it’s the app you’re using to write in that’s creating the distractions. Automatic spellcheckers and grammar tools with their helpful red squiggly underlines or word suggestions can interrupt the flow of your work and lose focus. Most word processing apps, like Microsoft Word and Google Docs, allow you to turn spellcheckers off and on as needed. Scrivener, my preferred writing app, has "composition mode" which is a full-screen writing mode. It blacks out everything but the page I’m writing. No toolbars, menus, or icons are visible. Scrivener is available for Mac, Windows and iOS. Scrivener has a trial which is exactly the same as the full version but will stop working after 30 days of use. (If you use it every day, it lasts 30 days; if you use it only two days a week, it lasts fifteen weeks.) Scrivener is $45 for Mac or Windows, $20 for iOS. FocusWriter is a free (with the option to tip when you download) app for Mac, Windows and Linux which allows you to turn spell checking off or on will enable you to turn typewriter sound effect off or on and allows you to write distraction free as well. 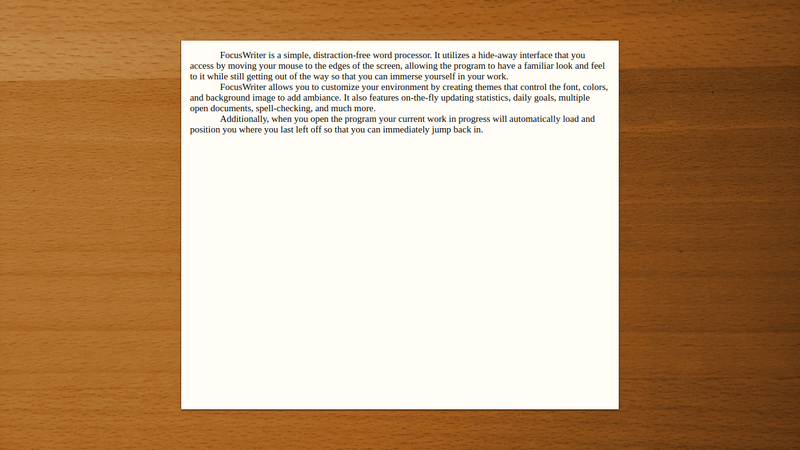 CalmyWriter is an online browser-based option that gives you a clean white page to write on without distractions. Taking it to full-screen mode gives you a bright white full screen without menus and icons. I find it the all white to be a bit too much for me but it’s a free option that will work with any web browser. For those like me, who are struggling to retrain their brain to focus when there are so many digital distractions. Some free browser extensions let you set up a list of websites to block for specific periods of time. If you’re like me and have eleventy billion or so tabs open and wanting attention, using a blocker extension can really help with focus. (Wikipedia! I cannot guess how many hours have been spent going down the Wikipedia rabbit hole). For those days when the procrastination monster has me in its grip I appreciate having the option to block out Mac apps as well as distracting websites. Freedom app can block Mac or Windows apps as well as specific websites or even the entire internet for whatever period you choose. It supports multiple devices, so it’s easy to set up to work across your computer, tablet and smartphone. Freedom app is available for Mac, Windows, iOS, Android with browser extensions for Chrome, Firefox and Opera. Free trial then priced from 6.99/month, 29/year or 129 forever. The site usually has a 30% off coupon code for Freedom yearly and Freedom forever. Forest is an app designed to help you to avoid looking at your mobile phone. "If you want to temporarily put down your phone and focus on what’s more important in real life, you can plant a seed in Forest. As time goes by, this seed will gradually grow into a tree. However, if you cannot resist the temptation of using your phone and leave the app, your tree will wither." Available for both iPhone and Android phones. Next week we'll wrap up our productivity series with some tips for creating habits, including triggers or cues, to help with focus and productivity. While you're here, why not sign up for our newsletter? It's sent out the end of every month and includes a digest of blog posts and announcements. When I decided to write some posts about Productivity this month the idea of a listicle type post of apps to help with your productivity seemed like an easy post to write but, the more I thought about it, and the more I researched current apps, the more complicated it got. There are plenty of “top 10 productivity apps” type posts out there so why bother? Instead of creating a “these are the top apps you should use” type post I’m going to give you a list, in no particular order, of apps the iwantmyname team use and those that I personally use and love. As a full remote team, with members across 3 different continents, these are the productivity apps that keep us connected and on track. Basecamp - We started using Basecamp here at iwantmyname in May. Now instead of having conversations, calendars, to-dos, project information, due dates and team discussions scattered across several apps, it’s now all in one space. To do items can be quickly assigned to team members and once checked off the rest of the team can be informed. Project timelines are easy to see, and overall communication and productivity have improved. The pricing of USD 99/month seems steep at first glance, but that’s a flat fee no matter how many team members, teams, or projects you add. Basecamp apps: web, iOS, Android, Mac, and PC. In addition to my full-time role at iwantmyname, I have a side gig business and a busy household. I’m always chasing to-do lists and deadlines. Not an Apple user? You can use Cortana, Alexa or Google Assistant to create voice memos, lists, set alarms, etc. Here we are, a month into 2019 already. How are your goals for this year coming along? Often we start off a new year with great intentions and goals but within a few weeks we’re back to our old comfortable habits. When I saw the month flip into February a few days ago it was a bit of a wakeup call. The procrastination monster had me in its grip all of January but it’s time to plan an escape. Change is vital to productivity and growth—personal, professional, or otherwise. For the next few weeks, here on the the iwantmyname.com blog, we’ll be talking about productivity, organization, and working toward our 2019 goals. For me, this means changing my old routines and habits and starting new ones, including starting a Bullet Journal, which is something I’ve resisted for years. If you are unfamiliar with the Bullet Journal concept, it is, an analog way to plan, take notes, and keep on top of your goals with a pen and a paper journal. I’ve resisted this because for 20+ years I’ve relied 100% on my tech devices for everything. Just holding a pen and writing for a sentence or two makes my hand cramp. So, why go to pen and paper when it physically causes me discomfort? Science! Turns out there are studies that prove that the act of physically writing, even if it’s in point form notes, helps your trigger brain’s memory, creativity, and analytical functions in ways that typing it into a laptop or mobile device does not. I’ll be using a Bullet Journal for the next 90 days as an experiment (my hand just cramped at the thought of it) in an attempt to improve my productivity and creativity. I’ll be posting my results in early May. In the meantime, if you’re interested in starting a Bullet Journal yourself, here are some resources to get you started. BulletJournal.com - the Bullet Journal is a little more complex than just writing things down with a pen. Lots of information about how the system works can be found here. And, because I’m a digital/app lover at heart, next post we’ll talk about digital apps to help you improve your productivity and reach your goals. Do you have experience with Bullet Journaling you’d like to share? A productivity topic or app you’d like us to write about? Joining me on my 90 day Bullet Journal experiment? Let us know and we’ll do our best to include it during our productivity focus over the next few weeks. When Andray was too young to know better, he wanted to grow up to be a monk and train at the Shaolin monastery in Henan, China. While his mom may have wanted to send him away once or twice in his childhood, the farthest away he got was the wuxing kung fu school three blocks away. Since then, he’s trained in capoeira, tae kwon do, and his current favourite martial art, Muay Thai. Now that he’s all grown up with a family (including twins, which keep him on his toes more than training ever did), Andray spends most of his time writing, as well as playing Super Smash Brothers on Saturday nights with his fiancée. The parenting moment he’s looking forward to the most, however, is when his daughters are old enough for him to take them to the neighbourhood kung fu school and sign them up for lessons. I’ve received a few job offers in my life, but none of them had ever been followed up with, “So, when can you come to New Zealand?” It sweetened the deal that I could catch the tail end of New Zealand summer after one of the most horrendous Ontario winters in memory. Turns out that was just the first of many welcome changes that came with working for iwantmyname. By the time I returned to Canada I was in love with New Zealand, with Wellington, and with the kind of company and coworkers I’d been looking for (or trying to build) for most of my career. I’ve weathered a few boom and bust cycles in the tech industry, and I’ve worked for household name corporations and startups where we worked at folding tables and you could count all the staff on one hand. I remember asking questions of one of the guys in the office, who didn’t have answers, because he was almost as new as I was. And now, just shy of five years in, I’m the old codger answering questions from the newbs. For us inveterate techies, the greatest working joy is to be able to build things, or make them better. I’ve gotten to do that consistently since I started. I didn’t come to iwantmyname from the domains industry, but I’ve learned what the broader industry is often like, and have come to greatly appreciate why our founders wanted to do things differently. As we humans online become ever more data points and revenue opportunities thanks to social platforms and advancing tech, I appreciate it even more. I’ve experienced the eureka moment of feeling competent regarding to the broader DNS ecosystem… and then realizing after another year that I was such a clueless (yet confident) newb the year before. I’ve also used that hard-won knowledge to train everyone on support who’s been hired after me, which is satisfying. I’ve become comfortable being the The Adult in situations that need one, which is invaluable. (Though on occasion still comes as a bit of a surprise.) Happily, I also have the luxury of having total faith in the abilities of the rest of the support team. I’ve learned plenty about hiring, that I have no problem working from home, that 15+ hour flights aren’t that bad, and that good folks will understand and pick up the slack when your cat dies. I’ve learned that there will always be messy aspects when building a business with a bunch of misfits, but that it’s never the end of the world. I’ve learned tonnes about how people tick and how business works in various places around the world. I think it’s especially important for us North Americans to learn that not everyone’s like us, or wants to be, and that everyone knows useful things that you don’t (yet). And I’ve learned how important it is continue to give back to those who helped you get where you are, and who will help you get where you want to be. So even as we grow globally — thanks, Wellington techies and customers! Imagine what could be if every tech scene had folks as passionate, fun, and helpful as you. In the past, planning for a company’s future has typically been above my pay grade. Not so here. I appreciate being part of the company’s first ten years, and, along with sharing info from our customers, helping to build the next ten.